Research work in the Molecular Thermodynamics and Modeling of Materials Laboratory (MTMML) focuses on the development and implementation of novel hierarchical methods and algorithms for the computer modelling and calculation of advanced material properties at the molecular, mesoscopic and macroscopic levels. Through this work, quantitative links are established between chemical constitution, processing conditions, and physical (thermal, mechanical, rheological, transport, interfacial, optical, dielectric) properties, which are critical for the optimal design of industrial processes and also govern the end-use performance of commercial products. In parallel, the molecular mechanisms underlying structure - property - processing - performance relations are elucidated with the objective of designing new, tailor-made materials. 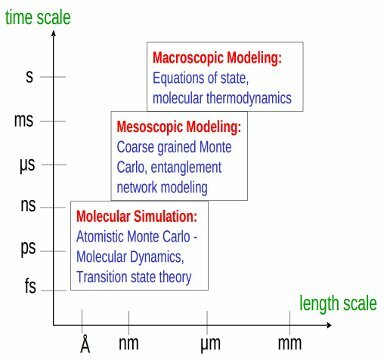 The hierarchical approaches developed and implemented at MTMML start with atomistic simulations addressing length scales on the order of tens of nanometers and time scales on the order of tens of nanoseconds (e.g., Monte Carlo, molecular dynamics, transition-state theory analysis of infrequent events) and proceed with mesoscopic methods (e.g., entanglement network modelling, kinetic Monte Carlo simulation, self-consistent field theory of inhomogeneous systems) to address longer time- and length scale phenomena. Finally, for the efficient design of novel processes mainly for the chemical, polymer and pharmaceutical industry, accurate macroscopic models, mostly in the form of equations of state (eos), are developed for phase equilibria and other thermodynamic properties of multicomponent mixtures. These eos are rooted to statistical mechanics and can be safely extrapolated to conditions where limited or no experimental data exist. (i)	Development of a new molecular model for the prediction of solubility of pharmaceuticals in water and other solvents (new activity initiated in 2008). In order to strengthen the collaboration with industry, a new project dedicated to research services was formed entitled Molecular Simulation and Thermodynamics of Fluids and Advanced Materials co-ordinated by Dr, I. Economou. Within less than a year, the project has signed three research contracts with industry with a total budget of € 53,700. More information about MTMML can be found at: www.mtmml.gr. Professor Doros N. Theodorou, School of Chemical Engineering, NTUA. Z. Kechagia, C. Kiparissides and I.G. Economou, “Determination of Liquid – Gas Partition Coefficients of BuA and MMA by Headspace-Gas Chromatography Utilizing the Phase Ratio Variation Method”, Fluid Phase Equil., 266, 21 – 30 (2008). I.G. Economou, E.K. Karakatsani, G.-E. Logotheti, J. Ramos and A. Vanin, “Multi-scale Modeling of Structure, Dynamic and Thermodynamic Properties of Imidazolium-Based Ionic Liquids: Ab initio DFT Calculations, Molecular Simulation and Equation of State Predictions”, Oil & Gas Sci. Tech., 63(3), 283 – 293 (2008). A. Grenner, I. Tsivintzelis, G.M. Kontogeorgis, I.G. Economou and C. Panayiotou, “Evaluation of the Non-Random Hydrogen Bonding (NRHB) Theory and the simplified Perturbed Chain-Statistical Associating Fluid Theory (sPC-SAFT). I. Vapor – Liquid Equilibria”, Ind. Eng. Chem. Res., 47(15), 5636 – 5650 (2008). I. Tsivintzelis, A. Grenner, I.G. Economou and G.M. Kontogeorgis, “Evaluation of the Non-Random Hydrogen Bonding (NRHB) Theory and the simplified Perturbed Chain-Statistical Associating Fluid Theory (sPC-SAFT). II. Liquid – Liquid Equilibria and Prediction of Monomer Fraction in Hydrogen Bonding Systems”, Ind. Eng. Chem. Res., 47(15), 5651 – 5659 (2008). Z.A. Makrodimitri and I.G. Economou, “Atomistic Simulation of Poly(dimethysiloxane) Permeability Properties to Gases and n-Alkanes”, Macromolecules, 41(15), 5899 – 5907 (2008). G. Tsolou, V.G. Mavrantzas, Z.A. Makrodimitri, I.G. Economou and R. Gani, “Atomistic Simulation of the Sorption of Small Gas Molecules in Polyisobutylene”, Macromolecules, 41(16), 6228 – 6238 (2008). E.K. Karakatsani, I.G. Economou, M.C. Kroon, M.D. Bermejo, C.J. Peters and G.-J. Witkamp, “Equation of State Modeling of the Phase Equilibria of Ionic Liquid Mixtures at Low and High Pressure”, Phys. Chem. Chem. Phys., 10(40), 6160 – 6168 (2008). I. Tsivintzelis, I.G. Economou and G.M. Kontogeorgis, “Modeling the Solid – Liquid Equilibrium in Pharmaceutical – Solvent Mixtures: Systems with Complex Hydrogen Bonding Behavior”, AIChE J., in press (2008). I. Tsivintzelis, I.G. Economou and G.M. Kontogeorgis, “Modeling the Phase Behavior in Mixtures of Pharmaceuticals with Liquid or Supercritical Solvents”, J. Phys. Chem. B, in press (2008). G.E. Logotheti, J. Ramos, I.G. Economou, “Molecular Modeling of Imidazolium-Based [Tf2N-] Ionic Liquids: Microscopic Structure, Thermodynamic Properties and Segmental Dynamics”, J. Phys. Chem. B, in press (2008). M. Yiannourakou, I.G. Economou and I.A. Bitsanis, “Phase Equilibrium of Colloidal Suspensions with Particle Size Dispersity: A Monte Carlo Study”, J. Chem. Phys., in press (2008). P. Ahlström, K. Aim, R. Dohrn, J.R. Elliott, G. Jackson, J.-N. Jaubert, M.E.R.A. Macedo, J.-P. Pokki, K. Reczey, A. Victorov, L. Fele Žilnik, and I.G. Economou, “A Survey of the Role of Thermodynamics and Transport Properties in Chemical Engineering University Education in Europe and the USA”, Chem. Eng. Ed., in press (2008). H. Leontiadou, I.G. Economou, “Microscopic Structure and Thermodynamic Properties of Aqueous Glycol Mixtures”, Molec. Simul., in press (2008). I.G. Economou, “Molecular Design of Rubbery Polymers for Membrane Applications”, International Workshop on Molecular Modeling and Simulation in Applied Material Science, Frankfurt am Main, Germany (2008). Invited talk. I.G. Economou, “Multi-Scale Modeling of Structure, Dynamic and Thermodynamic Properties of Ionic Liquids: Ab initio DFT Calculations, Molecular Simulation and Equation of State Predictions“, 11th European Meeting on Supercritical Fluids, Barcelona, Spain (2008). Invited talk. I.G. Economou, “Molecular Simulation of Rubbery Polymer Membranes”, 23hd European Symposium on Applied Thermodynamics, Cannes, France (2008). Invited talk. I.G. Economou, “Thermodynamic Properties and Phase Equilibria of Complex Fluid Mixtures: Equation of State Modeling”, Thermodynamic Colloquium, Erlangen, Germany (2008). I.G. Economou and Z.A. Makrodimitri, “Atomistic Simulation of Poly(dimethylsiloxane) Permeability Properties to Gases and n-Alkanes”, 7th Greek Polymer Conference, Ioannina, Greece (2008). I.A. Bitsanis, A.N. Rissanou, M. Yannourakou, I.G. Economou and D.Vlassopoulos, “Simulations of Temperature Induced Ageing and Crystallization in Dense Suspensions of Ultrasoft Colloids”, 7th Greek Polymer Conference, Ioannina, Greece (2008). G. Tsolou, V.G. Mavrantzas, Z.A. Makrodimitri, I.G. Economou and R. Gani, “Atomistic Simulation of the Sorption of Small Gas Molecules in Poly(isobutylene)”, 7th Greek Polymer Conference, Ioannina, Greece (2008). Award for best poster of the conference. I.G. Economou and Z.A. Makrodimitri, “Atomistic Simulation of Poly(dimethyl siloxane): Structure, Thermodynamic and Diffusion Properties to Gases and n-Alkanes”, Centennial AIChE Annual Meeting, Session No 519, Philadelphia, Pennsylvania, USA (2008). I.G. Economou, G.-E. Logotheti, J. Ramos and A. Vanin, “Ab Initio Calculations and Molecular Dynamics Simulations for [Imidazolium][Tf2N] Ionic Liquids: Microscopic Structure and Thermodynamic Properties”, Centennial AIChE Annual Meeting, Session No 182, Philadelphia, Pennsylvania, USA (2008). P. Ahlström, K. Aim, R. Dohrn, R. Elliott, L. Fele-Žilnik, G. Jackson, J.-N. Jaubert, M.E. Rebello de A. Macedo, J. Pekka Pokki, K. Reczey, A. Victorov and I.G. Economou, “A Survey of Thermodynamics and Transport Properties in Chemical Engineering Education in Europe and the USA”, Centennial AIChE Annual Meeting, Session No 62, Philadelphia, Pennsylvania, USA (2008). Ioannis G. Economou, “Energy, Environment and Business: A Global Challenge”, School of Business, Bifröst University, Iceland, July 2008. Ioannis G. Economou, “Molecular Simulation Prediction of Physical Properties of Complex Fluids”, Shell Global Solutions International BV, Amsterdam, The Netherlands, October 2008. Ioannis G. Economou, "Physical Chemistry", 2nd year course in Studies in Natural Sciences, Open University of Greece,, 2007 – 08, 2008 - 09. Nikolas Zacharopoulos, "Simulation", 7th Semester, Department of Product and Systems Design, University of the Aegean, 2008 – 2009. Nikolas Zacharopoulos, "Materials", 4th Semester, Department of Product and Systems Design, University of the Aegean, 2007 – 2008. Nikolas Zacharopoulos, "New Materials", 7th Semester, Department of Product and Systems Design, University of the Aegean, 2008 – 2009. Nikolas Zacharopoulos, "Material Selection for Design", 9th Semester, Department of Product and Systems Design, University of the Aegean, 2008 – 2009. Ioannis G. Economou, “Environmental Management”, MBA Program, Graduate School, American College of Greece, January – April 2008. Ioannis G. Economou, “Technology and Innovation Management”, MBA Program, Graduate School, American College of Greece, April – June 2008. Ioannis G. Economou and Niki Vergadou, “Molecular Simulation of Complex Chemical Systems with Emphasis to Practical Applications”, PhD Program in Chemical Engineering, Technical University of Denmark, Lyngby, Denmark, June 2008. Nikolas Zacharopoulos, "Materials", 2nd Semester, Graduate program on Design of functional and industrial products and systems, Department of Product and Systems Design, University of the Aegean, 2007 – 2008. Eleni Androulaki, “Thermodynamic Analysis Based on Statistical Mechanics and Knot Theory”, School of Applied Mathematics and Physical Sciences, National Technical University of Athens, March 2008. “Computer Αided Μolecular Design of Multifunctional Materials with Controlled Permeability Properties” [MULTIMAT], European Union, STREP FP6, Priority 3, NMP. Scientific director: Doros N. Theodorou. Duration: March 1, 2005 – February 28, 2008. “Development of New Molecular Simulation Methods and Macroscopic Models for the Calculation of Microscopic Structure and of Thermodynamic Properties of Complex Polymer Systems”, Greek Secretariat of Research and Technology, Program for Research Support (PENED). Scientific director: Ioannis G. Economou. Duration: December 1, 2005 – November 30, 2008. “Development of Sustainable Industrial Processes: Experimental, Theoretical and Computational Investigation of Thermodynamic Properties and Phase Equilibria of Ionic Liquid Mixtures”, INTAS. Scientific director: Ioannis G. Economou. Duration: September 1, 2006 – May 30, 2009. “Investigation of Structure, Thermodynamic and Transport Properties of Poly(styrene-co-acrylonitrile) in High Temperatures”, Greek Secretariat of Research and Technology, ENTER 2003 Program. Scientific director: Ioannis G. Economou. Duration: October 1, 2006 – October 30, 2008. “Polymer Surfaces Responsive to Thermal and Chemical Stimuli: Towards the Micro-design of ‘Intelligent’ Materials”, Greek Secretariat of Research and Technology, Greece – USA Research and Technology Cooperation in Materials Research. Scientific director: Ioannis G. Economou. Duration: June 1, 2006 – September 30, 2008. “Implementation of SAFT / PC-SAFT Computer Codes for Polymer and Non-Polymer Systems into MAPS”, Contract Research Services, Scienomics SARL, Paris, France. Scientific director: Ioannis G. Economou. Duration: March 1 – August 30, 2008. “Implementation of Computer Codes for Physical Properties of Polymer and Non-Polymer Systems into MAPS – Phase II”, Contract Research Services, Scienomics SARL, Paris, France. Scientific director: Ioannis G. Economou. Duration: September 1, 2008 – February 28, 2009. “Molecular Simulation of Diffusion of Hydrogen, Carbon Monoxide and Water in Heavy n-Alkanes at High Temperatures and Pressures”, Contract Research Services, Shell Global Solutions, Amsterdam, The Netherlands. Scientific director: Ioannis G. Economou. Duration: December 15, 2008 – April 15, 2009. “Reorganization of the Liaison Office of NCSR “Demokritos””, Greek Secretariat of Research and Technology, Program for Support of Liaison Offices in Universities and Research Centers. Scientific director: Ioannis G. Economou. Duration: January 1, 2005 – July 30, 2008. Professor Georgios Kontogeorgis, Department of Chemical Engineering, Technical University of Denmark. Development of thermodynamic models for pharmaceuticals. Dr. Xenophon Krokidis, Scienomics SARL, France. Development of scientific software for prediction of material properties kai design of chemical processes. Professor Maria Eugénia Rebello de A. Macedo, Department of Chemical Engineering, University of Porto, Portugal. Molecular simulation of the solubility of pharmaceuticals in water. Professor Vlasis Mavrantzas, Department of Chemical Engineering, University of Patras. Molecular simulation of polymers. Dr. Ioannis Bitsanis, Institute of Electronic Structure and Laser, Foundation of Research and Technology, Hellas, Heraklion, Crete, Greece. Mesoscopic simulation of colloids and polymers. Professor Costas Panayiotou. Department of Chemical Engineering, Aristotle University of Thessaloniki, Greece. Development of a lattice equation of state for non-ideal fluids. Professor Cor Peters, Department of Chemical Engineering, Delft University of Technology, The Netherlands. Modeling thermodynamic properties of ionic liquids. Dr. J. Ramos-Díaz, Department of Macromolecular Physics, Instituto de Estructura de la Materia - CSIC, Madrid, Spain. Quantum-mechanics calculations for ionic liquids. Scientific Director of Technology Transfer Office, NCSR “Demokritos” (up to 7 / 2008). Member of Research Council, NCSR “Demokritos”. Visiting Professor, Department of Chemical and Biochemical Engineering, Technical University of Denmark, Lyngby, Denmark. Visiting Professor, American College of Greece, Graduate School, Aghia Paraskevi Attikis. Adjunct Professor, Open University of Greece. Collaborating researcher, Centre for Management and International Business, Bifröst University, Iceland. Chairman, Working Group on Thermodynamics and Transport Properties, European Federation of Chemical Engineering. Member of the Editorial Board, Scientific Bulletin of University Politehnica of Bucharest, Series B: Chemistry and Materials Science. Referee for the following international scientific journals: AIChE Journal, Canadian Journal of Chemical Engineering, Chemical Engineering Research and Design, Chemical Physics Letters, Colloid and Polymer Science, Computers in Chemical Engineering, Energy & Fuels, Environmental Science and Technology, European Polymer Journal, Fluid Phase Equilibria, Industrial and Engineering Chemistry Research, International Journal of Refrigeration, Journal of the American Chemical Society, Journal of Chemical and Engineering Data, Journal of Chemical Physics, Journal of Computational Chemistry, Journal of Physical Chemistry, Macromolecular Rapid Communications, Macromolecules, Polymer, Theoretical Chemistry Accounts. Member of International Scientific Review Committee of the Directorate of Applied Chemistry and Physical Chemistry, Institut Français du Pétrole, Paris, France, June 2008. Department of Material Science, University of Ioannina, February 2008. Department of Process Engineering, Université Paris XIII (Paris-Nord), Villetaneuse, France, September 2008. Consultant, Scienomics SARL, Paris, France. Non-tenure teacher 407/80, Department of Product and Systems Design, University of the Aegean.